January is an exciting month for children's book lovers and book bloggers. On Monday, January 10, 2011, the American Library Association will announce their choices for the best youth books this past year. The ALA Youth Media Awards include Caldecott Medal and Newbery Medal, among others. In addition, Cybils (Children's and Young Adult Bloggers' Literary Awards) just released the 2010 Finalist List. I'm extremely excited and pleased to report that our Cybils fiction picture book recommendation and nomination, Shark vs. 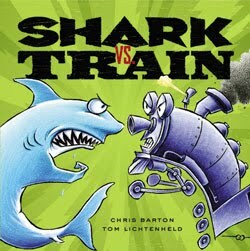 Train by Chris Barton, illustrated by Tom Lichtenheld, is one of those selected as a finalist. Over 250 books were nominated in this category and only seven made it onto the distinguished 2010 Fiction Picture Books Finalist List. There's plenty of Caldecott buzz on book blogs as of late. It appears that, unlike last year, no favorite front-runner exists for this year's Caldecott Award. 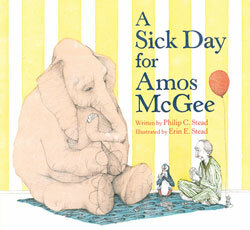 I intended to review A Sick Day for Amos McGee several months ago when we first read it but never got around to finishing my post. It is one of my personal favorites from last year, but it took awhile for my daughter to warm up to it. Hopefully I'll get a chance to finish my review before the Caldecott Medal is announced next week. It's certainly a strong contender for an award this year. City Dog, Country Frog by Mo Williams, illustrated by John Muth and Art & Max by David Wiesner have also both made their way onto many prediction lists. In my opinion, Chalk has a decent shot at an ALA award. The illustrations are incredible and both my kids was were strongly impacted by the power and magic of Thomson's artwork. So much so that my toddler son took a marker and drew a dinosaur on our kitchen floor. He was very disappointed that the dinosaur did not come to life. Apparently the marker wasn't magical, although I was relieved the marker was washable. Over the winter break I was surprised to receive an email from author/illustrator Bill Thomson himself thanking me for my review of his book. It was a surprise and an honor to hear from him. A Fuse #8 Production - "A Fuse #8 Prediction: Newbery/Caldecott 2011"
100 Scope Notes - "2011 Caldecott Medal Predictions"
Wizards Wireless - "2011 Caldecott Predictions"
Seven Impossible Things Before Breakfast - "My Caldecott Ramblings: Or, What I Would Add to Betsy Bird’s List and How I Can Really Get Behind Most of the Titles on Her List Anyway"
We're not exactly qualified to make predictions about the year's best books considering that we've had the chance to read only a small fraction of the titles published. However we can pick favorites from those that we've read. So, we'll join others in publishing our favorites of the year list now that 2010 has come to a close. What are your favorite books from 2010? Who do you think should win the 2011 Caldecott Award? Oh yay! I am so happy the Buffalo was one of your favorites! I nominated Interrupting Chicken for the Cybils. I love it!! Oh love seeing all of the books.. Have a great day.. I don't have little ones so I don't buy picture books anymore but I was all about the Caldecott's when I did. I still have all their books too and I'll never give them up! I think my pick for the Caldecott Award is between Chalk and Art and Max. Can you believe I missed Shark vs. Train. I just heard about it a week or so ago when I started seeing buzz around it on awards lists. I can't wait to get it now! I don't feel qualified to pick a Caldecott either because I'm usually limited to the books for my kids age group but I love seeing other's predictions!